In the outside world, Buddy and Grandpa kept trying to wake up Landon but they couldn’t. Worse than that, his body was just a tiny bit transparent. “What’s happening to him, Buddy?” Grandpa was starting to get frantic. He didn’t want to call his son at work yet, but if something weren’t done soon to bring Landon out of this, he’d have to. Without answering, purple energy crackled around the small, golden dragon and he vanished. Bounce, bounce, bounce, Landon was surprised to find out he made it all the way to the bottom of the staircase. 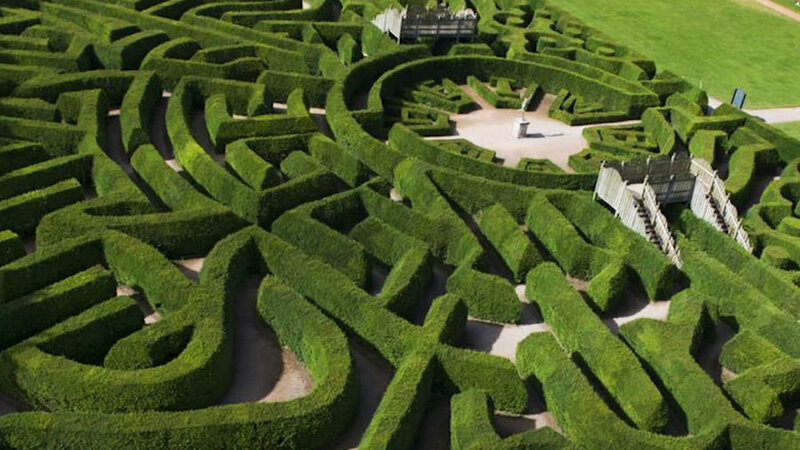 It ended right at the beginning of a maze but it was a maze he had never heard of before. When he was on the staircase, everything had been black and his surroundings were only dimly lit. Now it was full daylight and the staircase was gone. 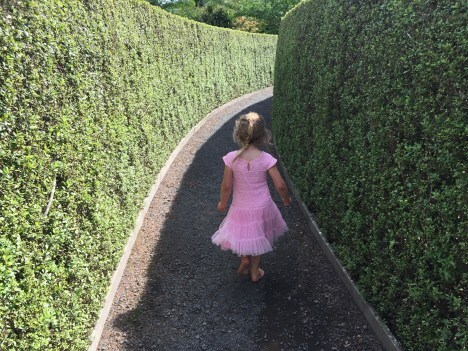 The maze he was in was made of giant, trimmed hedges taller than Grandpa’s house. He could go forward, back, left, or right but didn’t know which way he should turn. “Maybe I can still bounce high.” He jumped up, but only got as high as he could normally jump. Landon expected to find himself in his bedroom but that didn’t happen. He was still in the maze. Still nothing. A cold breeze blew from in front of him making him shiver. “Well, not going that way.” He turned to his right and saw a big, scary looking clown leering at him. “Yah!” he screamed. Then the nine-year-old realized it was a picture, like a movie poster for a horror movie or something. As Landon turned more to his right, he didn’t see the eyes of the clown in the picture follow his motion or the evil smile on the face get just a little wider. “Don’t worry, Landon. Buddy gave me a spell. It’s really easy but you have to come with me.” She held out her hand. “It won’t work here. We have to go to a different part of the maze.” She took his hand and pulled almost yanking Landon off of his feet. With that, Ana pulled Landon after her and she was running so fast, he could hardly keep up. She expertly made a complex number of lefts and rights, navigating through this part of the maze like she’d been here all her life. “How…how do you know the way?” Landon was huffing and puffing because they were running so fast. He felt like something was wrong but he didn’t know what. The sky overhead was getting more gray and cloudy. It looked like it might rain. The air was colder, too. “Ana…Ana, wait!” Landon pulled his arm away from her hard and got his hand free. Then he stopped. “Just follow me. I’ll show you. Buddy has been teaching me a lot of magic since you’ve been gone.” She tried to grab his hand again but he moved it away from her before she could. She was acting really weird. It looked and sounded like Ana but what if it wasn’t her? He reached for the magic lamp amulet around his neck to see if its light would reveal anything but it wasn’t there. “Missing something, Landon?” Ana pulled a chain out of the collar of her shirt and it was there. She was wearing his amulet. “Wouldn’t you like to know?” She was smiling at him, but it was an evil smile. Landon thought he might have just enough magic to do it if he was fast enough. He mentally commanded the lantern to shine a bright light over Ana. “What have you done?” She shrieked. Then she wailed and burst into flame. “Oh no! What have I done?” The boy thought he’d lit one of his best friends on fire. Then she began to shift and change and a moment later, laying at his feet was an adult-sized person who looked like they’d been dead for a thousand years. That parts that were still flesh were totally mummified. The third-grader whirled around and ran back the way he’d come as fast as he could. When he got to the fork again he stopped, exhausted. He sat down, his chest heaving, desperate to get air into his lungs, and he was shivering with fright. “It…wasn’t…Ana.” It took him a minute to absorb what that meant. Something in the maze was trying to trick him and could appear even as someone he knows really well. That also meant Buddy might not even know he’s in trouble if he and Grandpa just think he’s in bed sleeping. And that meant, the child was probably on his own. How was he going to get out of this mess. Then he remembered that he had been so scared, he forget to get his lantern amulet away from the dead person. He decided to rest a minute before heading back. He was still sitting, facing the left hand fork where he had gone with the fake Ana. Directly behind him, from the right fork. there was a movement in the shadows. Landon thought he heard something and turned. There was a shape in the darkness and then a glint of gold. “Well, okay Buddy.” Landon would have preferred that the dragon lead the way but if Buddy had his back, he’d be fine. “Let’s go then.” The child started walking with Buddy behind him. What Landon couldn’t see was the change of expression on the dragon’s face, the evil look it had. Then Buddy opened his mouth and thousands of needle-thin, razor-sharp teeth were revealed and at the same time, he began to change color and get bigger. It was no longer a dragon that followed Landon but a giant, carnivorous worm with a huge appetite and that loved the taste of children’s flesh. This is a direct sequel to The Dragon’s Legerdemain and we find Landon has been trapped in an exceedingly dangerous realm this time. Actually, Landon created this dream realm and the dream reapers who inhabit it including its list of rules. Frankly, I’m not sure how Landon will get out yet but I’m sure I’ll work something out. I know he really wants me to write this so hopefully I’ll get it right. This may be his most exciting and hazardous adventure yet. Welcome to the latest entry in the series of adventures I’ve been writing for my grandson for almost a year-and-a-half now. To read the series from the beginning, go to The Day a Dragon Came to Live with Us. At the bottom of that story is a link to the next. Each subsequent story has a link to the next chapter, so all you have to do is keep reading and clicking and you’ll eventually get back here. The next chapter in the story is Riddle Me This! Never trust a dragon in a dream maze. Nice mix of dreams and reality. Or your little friend. Thanks.